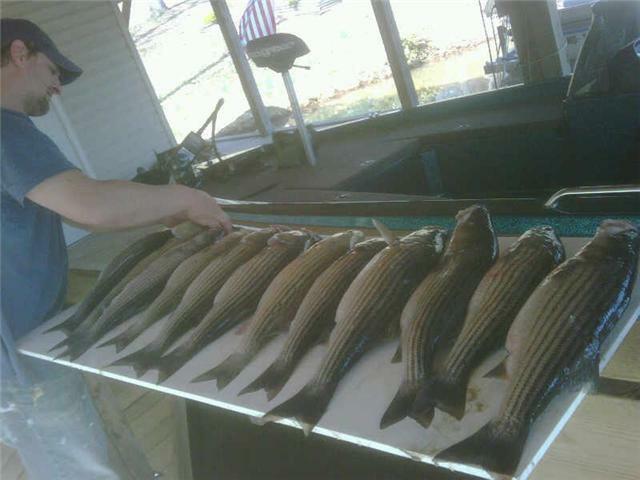 I just wanted to send a little note to thank you for showing us how to catch stripers last year (April 25). We became addicted and I don’t think Bob or myself has fished for bass since we took that trip with you!! My girlfriend got 6 of the Waterbugz planerboards for me last year, and I bought a bait tank, wireless trolling motor, new rod/reel combinations, rod holders, etc. so that we could try to catch stripers on our own. We remember you telling us “don’t think you can come out here tomorrow and catch fish”…of course, you were right! We struggled BIG TIME. We were happy when we caught 3 keepers in one morning!! Got to start somewhere right? Well, after struggling last year, we were pretty confident we had it figured out for this spring. So the 3 of us (Brad, Bob and Tim) went fishing Saturday 3/20. We woke up at 3:30am and caught bait and debated where to fish. Well, 5 minutes after putting out the first bait we had a keeper in the boat. We ended up catching our limit by 1:00pm and needless to say we were very happy. I recently became a va-outdoors.com forum supporter and posted a report of my recent fishing trip, and made sure to thank you for showing us how to catch stripers. A few people responded by saying things like “Hemby is the man”, “Jim Hemby is the striper KING”, etc. Of course I know from experience that you are the “striper king”, that’s why I still look at your blog every morning when I get in to work. You got us ADDICTED to striper fishing and we love when those planer boards go skipping across the water! (I attached a picture…that’s Bob figuring out which one to clean first).